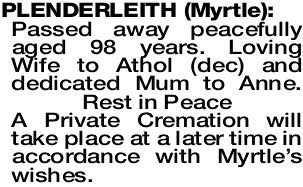 Passed away peacefully aged 98 years. Loving Wife to Athol (dec) and dedicated Mum to Anne. Rest in Peace A Private Cremation will take place at a later time in accordance with Myrtle's wishes.